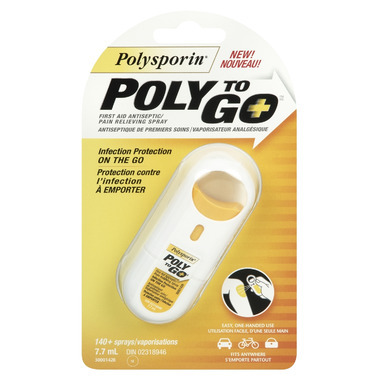 POLY TO GO provides convenient infection protection on the go! The sturdy, non-aerosol spray resists crushing and fits anywhere, so you can take it with you wherever you go. Helps prevent infection and temporarily relieves pain and discomfort of minor cuts, scrapes and burns when they happen. Treat: Spray on minor wounds as required 1 to 3 times daily. Protect: Apply a sterile bandage, such as BAND-AID Brand Adhesive Bandage, if available. Medicinal Ingredients: Benzalkonium Chloride 0.13% and Pramoxine Hydrochloride 1%. Non-medicinal Ingredients (alphabetically): edetate disodium, propylene glycol, water. CAUTIONS: For external use only. Avoid contact with eyes. If this occurs, rinse thoroughly with water. Do not use over large areas of the body, in deep or puncture wounds, on animal bites or serious burns, or for more than 7 days unless directed by a doctor. If irritation occurs or the condition persists or gets worse, stop use and consult a doctor. Keep out of reach of children. Great product. easy to use and great when you are out and about with the kids and they get hurt. Luckily we haven't had to use it yet, but it fits perfectly in the small diaper bag emergency kit that we have. It's nice to have a little something when we're walking on the trails, or going on a bike adventure. Great product - convenient, portable, and works well. Love this product! We bring it with us on hikes. Small size makes it easy to carry along. Great product to have in First Aid Kit for outdoor trips in the summer.